Mycelia Cultivation: After the inoculation, remove nutrient bags on previously-disinfected cultivation shelf, control the temperature at a range of 20-25 degrees Celsius, regulate relative air humidity at 60%-65%. Besides, ventilate the room 3-4 times per day and each time should be kept for at least 30 minutes. Through lightproof cultivation, mycelia become fully-grown in bags after 50 days or so. 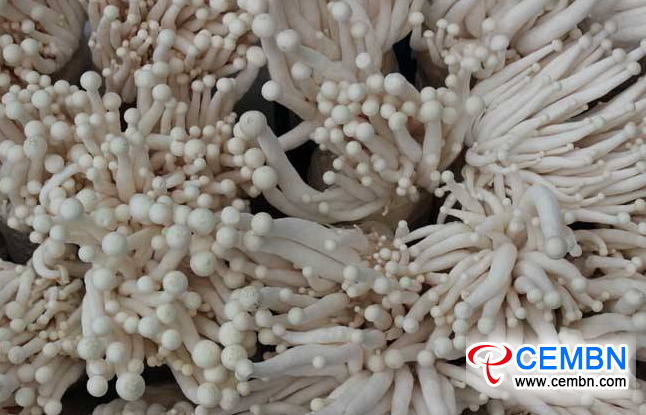 After-mature Cultivation: After mycelia of Seafood mushroom completely grow up, be sure to go on the cultivation for 50 days at a temperature range of 20-25 degrees Celsius. Fruiting occurs when physiological maturity is reached and sufficient nutrients are kept. Mycelium-stimulation and Water Injection: When fruiting season arrives, set up nutrient bags on the ground or bed shelf, untie the mouth, and allow for upright fruiting. And, lightly remove old mycelia on the surface of compost so as to stimulate the formation of sporocarps. It should be noted that the degree of mycelium-stimulation directly impacts the formation and output of sporocarps. After that, inject water into the bags, after 2 hours, empty it out and move on to next process. Bud pressing: After setting up bags, cover non-woven fabric or newspaper in bag mouth and spray water to retain the moisture. And, keep the temperature of house at a range of 10-16 degrees Celsius, relative air humidity at 90%-95%, concentrations of carbon dioxide under 0.1%-0.2%. After 7 days of weak-light illumination (10-30lx), a layer of aerial mycelium grows on surface of material in bag mouth while a layer of mycoderm also forms, at this time, grower could regulate and control day and night temperature at 8 degrees Celsius. Within several days, mycoderm changes from white to gray, which indicates that primordia are about to form, then be sure to gradually enhance the humidity, improve the illumination to 50-100 lx. After 3-5 days, close primordia appear on surface of gray mycoderm, and they gradually differentiate into mushroom buds.